The Stethavini are small, typically ranging from four and a half to five and a half feet, and very slight- many appear almost fragile or birdlike. Their skin tends to be very pale with a slight greenish tinge. Stethavini breathe almost any hydrogen/oxygen mix, rather than only oxygen; they are most comfortable in high-moisture environments, or underwater, and tend to grow rather out of breath in dry air. Their lungs are located along their backbones and they breathe through small gills positioned in the vicinity of the human temple. They are extraordinary sprinters and jumpers, occasionally jumping as much as forty feet vertically or from a running start. Stethavini pupils are slit horizontally, like a snake’s, and are usually slightly sunken into their faces. They have a dark, flat crest on their heads which rises when they are extremely agitated. 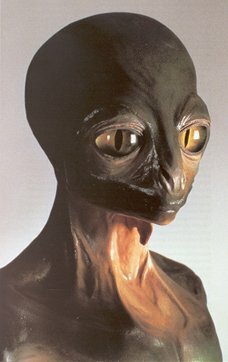 Dale Russell’s attempt to depict reptilian humanoids. Not quite the same as a Stet, but close. For more, see here. Stethavini are known as a compulsive, high-strung, and nervous race. They have difficulty handling high-stress situations of any type and hate being cornered. Typically they will crack easily. Once they panic, they are extremely difficult to handle; they may go into hysterics, wildly attack captors or enemies, or attempt suicide, and there is generally no indication of which way their panic state will swing. They have a not entirely undeserved reputation for being untrustworthy and more than a little mad. Behaviors that other races consider neurotic are common: paranoia, phobias, compulsions, delusions, extreme jealousy, kleptomania, megalomania, et cetera. They are prone to quick decisions, especially in bad situations. They typically place their priorities in very strict order: themselves, their friends, money, and everything else, with minor variation. They are not known for being far-sighted or overly unselfish, and their government is notoriously unstable. They strike other peoples as being, overall, a very quick race- quick to anger, quick to forgive, quick to decide, even quick-talking and quick-moving. Surprisingly, they get along relatively well with other races, possibly because they have trouble getting along wither their own kind anyway, and are often found in alien colonies, quite besides the cross-racial experiment Peruve, colonized jointly by Earthlings and Stethavini. The Stethavini government is currently a democracy, although in the past 50 years or so the government has ranged from socialist to benevolent dictatorship, touching on most points in between. The most infamous was the reign of the Second Prophet, Bethatone, characterized by twelve years of violent xenophobia and violent religious fervor which involved many atrocities, including suicide bombings and other terrorist acts on alien spaceports. The Stethavini government is still attempting to normalize their relationship with other alien governments although Bethatone died three decades ago. The Stethavini “navy,” a badly-organized, patchwork army consisting mostly of one-man fighters, is either the most mocked or the most feared depending on who you speak to: occasionally, it is both. Despite the threadbare quality of the Stet space force, their explosive unpredictability makes most people wary of the Stethavini in general and armed ones in particular.